At the end of the first half with issue #6, it finally seemed to pick a lane and abandoned new readers in favor of already-established fans. In other words, Marvel decided that a comic buyer in the hand is worth two in the bush. That said, I'm still interested in knowing more about The Guardians and their adventures, even if it means that I have to keep looking up things on the internet in order to more fully understand what's going on. Let's get into the back half of All-New Guardians of The Galaxy and see where it takes us, shall we? 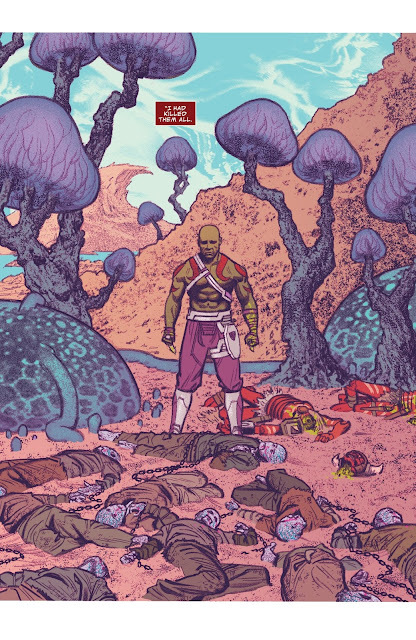 In this standalone issue focusing on Drax, we finally learn the truth about his recent turn toward pacifism. During a hunting trip, he encountered a band of slavers that he slaughtered, meaning to free the slaves. . .but not realizing that the slavers had bonded their captives lives to their own. By destroying them, Drax also killed dozens of innocents. He cannot forgive himself for his thoughtless actions and now only turns to violence as a last resort. Starting off the back half with another "one and done" filler issue that has little to do with the ongoing story except to explain why Drax has been Destroying less than usual. The story seems pretty light and somewhat out of place, considering that just one issue before a whole new storyline was introduced. The art by Greg Smallwood lends a bit of needed weight with a highly-detailed style that matches the gloomy nature of the story. Overall, this issue is obvious filler that feels out of place immediately after the introduction of an entirely new storyline, with a light plot that could have been covered in a few pages of a regular issue instead of being padded out to fill an entire one of its own. It's not bad. . .just a bit unnecessary. With Rocket dying after being poisoned by the Shi'ar Raptors that attacked their ship (in issue #6), Star Lord pursues their leader, hoping to gain the antidote before it's too late. After a brutal battle, he succeeds and saves Rocket, but at the cost of letting the Raptor leader escape with a set of extremely powerful Nega-Bands. . . Returning to the newly-established storyline started in issue 6, this issue had me feeling more than a little lost. 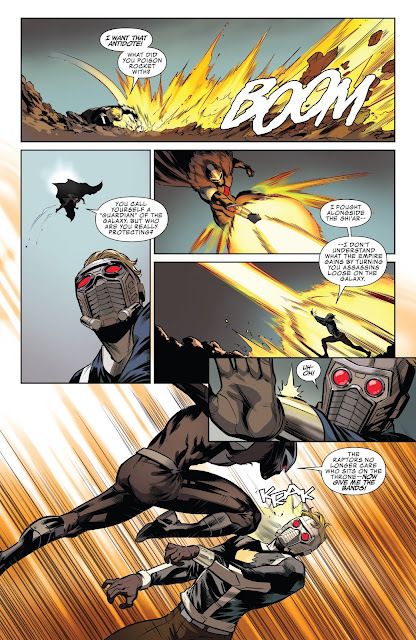 It seems like the Guardians and the Raptors have a long history as adversaries, but to a reader new to Guardians of The Galaxy, it meant several trips to the internet to see what Star Lord and Talonar (the Raptor Leader) were shouting at each other about over the explosions. There's another artist change on this issue as well. . .making it the 5th artist in 8 issues. All of the upcoming issues have different artists too. I'm not sure if 8 artists over 12 issues is a record or not. As far as this one goes, he has a much more traditional comic book style than most of the others. It's on the good side of average, with a few really nice panels here and there. 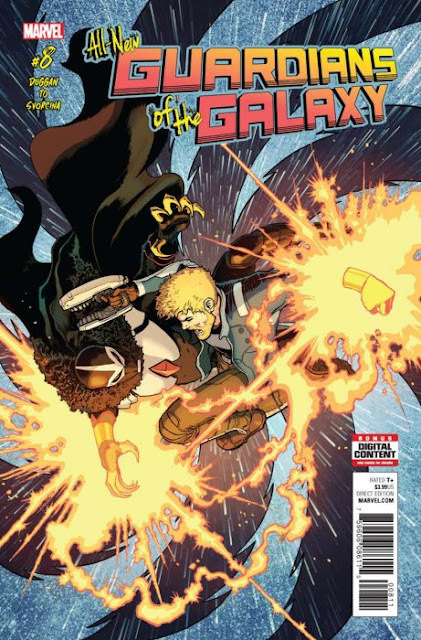 Overall, even though this issue was mostly a running battle scene, there are a lot of references to past continuity throughout, establishing a new direction for this series that is NOT new reader friendly, but aimed at existing GOTG fans. It's not a BAD story, but the shift is a bit disappointing. 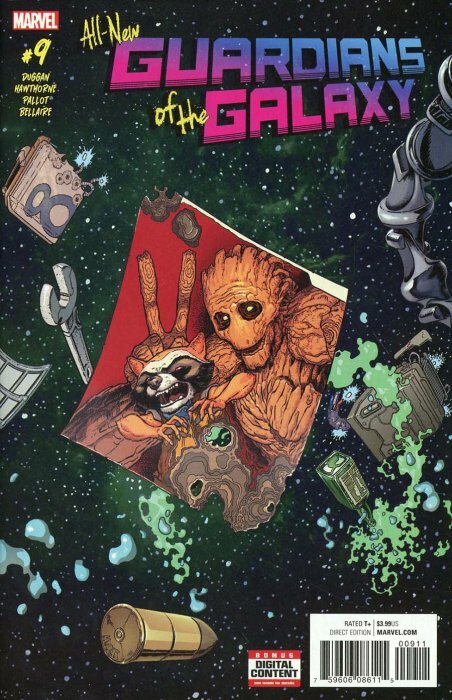 In this stand-alone issue focusing on Rocket and Groot, the pair travel to a Thieves' World in order to purchase the layout of a heavily-guarded vault as part of the Gaurdians' "Final Heist" (from issue #1). While there, they are attacked by a mysterious being calling himself "The Gardener", who seemingly kills Groot during the battle, but Rocket escapes with a splinter of his friend that he is able to partly regrow him from. . .
And here we get yet another "one and done" issue interrupting the story at hand. 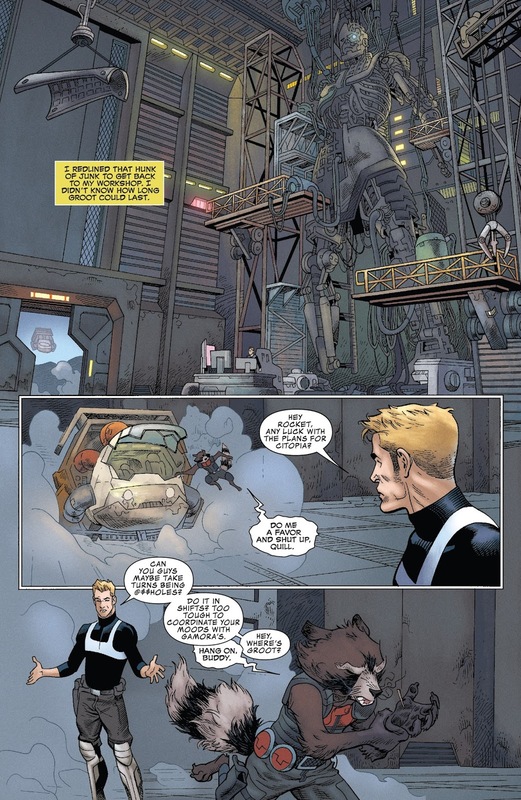 This time out, explaining why Groot is stuck in "Baby Groot" mode. . .well, at least trying to present a reason other than that everyone in the friggin' world LOVED Baby Groot in the second GOTG movie, and this series was ORIGINALLY supposed to be a gateway from the movies to the comics, so Baby Groot! The story isn't bad, but it's obvious filler that makes me pretty sure that Marvel trying to double-ship this title MIGHT have been a bit of a mistake. None of these one-shots have really been bad, but they're annoying in the way they interrupt the story. I'm reading them all at once and it's annoying. I can only imagine if I was picking this title up issue by issue. . .
Also, another artist. This one has a hyper-detailed style that makes this issue more enjoyable than it really ought to be. I'd say one of the best artists yet. . .even if he does draw Star Lord completely differently than anyone else in this series. Overall, not a bad story, and it has some great art. . . but annoying as an interruption to the story at hand and contributing to the disjointed feel of this series as a whole. 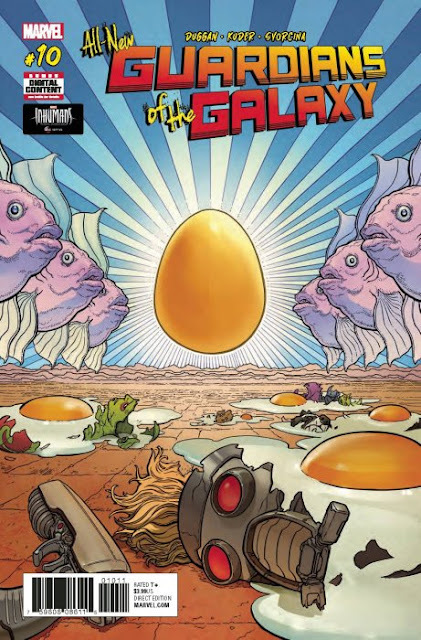 When the Guardians bring the fake Monarch Egg to the Grandmaster as part of their triple-cross heist fiasco, they discover that they've been crossed AGAIN. . .the Grandmaster knew the egg was fake and the Collector was using the Guardians to find out if his brother was still the same Grandmaster he knew before. It seems there's been a universal cataclysm of some sort that has slightly changed everything and it was all nothing but a test to discover if the Guardians are capable of working with the Cosmic Elders to help them hunt down the Infinity Gems. First stop, The Gardner. The Cosmic Elder that "killed" Groot, is the last known holder of the "Soul Stone" that Gamora has been searching for, and who has been acting dangerously insane since encountering Loki. It seems like the writer suddenly remembered that he forgot to finish the heist story he started in issue #1 and that sort of got dropped in favor of the "Nova Corps and Shi'ar Talons/ Nega Bands" storyline. Unfortunately, even though we finally get an end to what was the more interesting story of the series, it's not a great end. It's actually more of a setup for yet ANOTHER story (that takes place when this volume of GOTG reverts back to the previous volume after issue #12) that delves deep into the Infinity Gems, the Cosmic Elders, and Thanos. Oh. . .and Loki is in there too. It's sort of all over the place. In other words, the writer took the last remnant of new-reader friendly material and turned it into a deep continuity dive introduction to the next/previous volume of Guardians of The Galaxy that's basically meant for established fans. At least the original artist also returns one last time (except on covers) to finish up what started this series off, but even his fantastic art and great facial expressions can't keep the bitter taste out of my mouth. Overall, the end of the original storyline is a somewhat hard pill to swallow, as the series finally completely abandons what made me like it in the first place. It's a disappointing moment for me that really makes me not even want to read the final two issues. . . But I'm no quitter, son. Let's do it! When Nova Corpsman Rich Rider discovers a long-forgotten distress call from his brother, Robbie, who he assumed died in the same battle that claimed most of the Nova Corps, Rich Rider heads to the abandoned Nova homeworld of Xandar in search of him. Unfortunately, Rich doesn't know that his brother has been captured and brainwashed by the Fraternity of the Talon and is no longer known as Robbie Rider, but as Talon-R. . .the leader of the Talons that attacked the Guardians of The Galaxy and escaped with the powerful Nega-Bands. 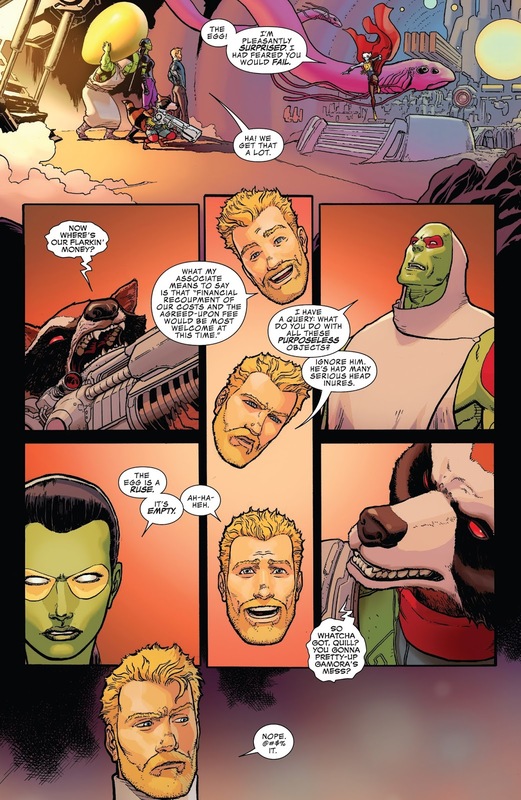 At this point, Guardians of The Galaxy has abandoned all attempts to appeal to new readers. This issue deals with characters, groups, and plotlines from previous comic series and continuity to the point that, to a new reader such as myself, it's almost unreadable without the help of the internet. The Guardians of The Galaxy don't even appear in this issue. It's all about two Nova Corps brothers who are now on opposite sides of a building conflict. The story itself isn't BAD. It's just that it really seems like the reader is dumped right into the middle of something that's already going on without a single bit of explanation. The dark, somewhat vague and scratchy style of the artist on this issue perfectly complements this tale of a noble warrior brainwashed into joining with his enemy. Overall, even though this isn't a BAD story, and it's actually one of the better "one and done" issues of this series, it really feels out of place. It's probably setting things up for events in the next/previous volume of Guardians of The Galaxy, but that's not what I'm reading THIS volume of the series for. In this final issue, the Guardians visit Earth in the wake of Secret Empire in order to see if any of their allies can help lead them to the Infinity Gems. Unfortunately, they are unsuccessful. When they leave, they discover Deadpool has stowed away, attempting to escape Earth after he allied himself with Steve Rogers. The Guardians dump him back on Earth. . .only to shortly thereafter discover Ant-Man has ALSO stowed away for the same reasons. Fortunately for him, the Guardians like Ant-Man better than Deadpool and allow him to stay with them. A meeting with Man-Thing reveals that the Infinity Stones are missing in EVERY reality that he can see, and that there are many different versions of the Guardians of The Galaxy searching for them. 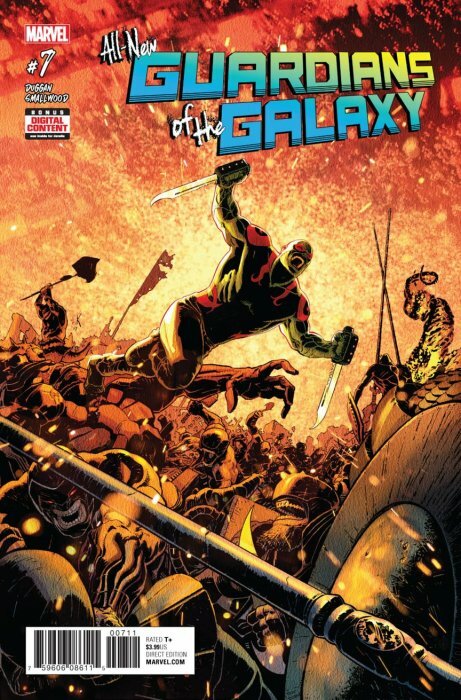 Armed with this bit of information and a new team member, the Guardians resume their search, only to find themselves boarded by the Nova Corps, who are intent on arresting them. . . This final issue is really a sort of Secret Empire epilogue that sort of forces Ant-Man onto the team. It's a good thing I actually read Secret Empire, or else I would be pretty lost on this one. As it stands, it's a disappointing final issue in that it's not really a final issue at all. It seems that after this issue, Guardians of The Galaxy reverted back to the previous volume, but with "Legacy" numbering, starting with issue #146. My daughter didn't stay with the series because she thought it was just cancelled, so we don't have any of the issues that came after. . .but I have to say that a comic series going from volume 4 to volume 5 and then BACK to volume 4 would seem to be more than a little confusing for the average comic collector such as my daughter and defeating the purpose of the whole "Legacy" initiative. In other words, as "All-New Guardians of The Galaxy", this series limped over the finish line as a hollow shell of what it started off as. As "Guardians of The Galaxy" in general, it sort of just went back to where it was and who knows if these issues even really "count" in continuity. At the end of this series, I have a pretty bitter feeling about it. When I read the first couple of issues, I was EXTREMELY happy with what I had in my hands. THIS was what I wanted to see when I decided to try out some newer Marvel comics. It had adventure, action, snappy dialogue, humor, and a great story starring a ragtag gang of misfits who didn't really like each other that much, but knew they made a good team. 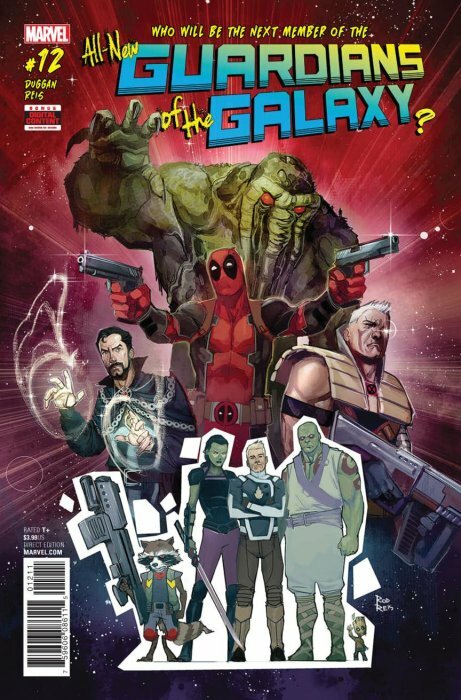 All-New Guardians of The Galaxy was a fantastic bridge between the movies and the comics! But then it all fell apart, and quickly. From filler issues to completely abandoning the new reader-friendly tone set at the start of things, to having EIGHT artists on TWELVE issues, this series quickly fragmented and was all over the place. 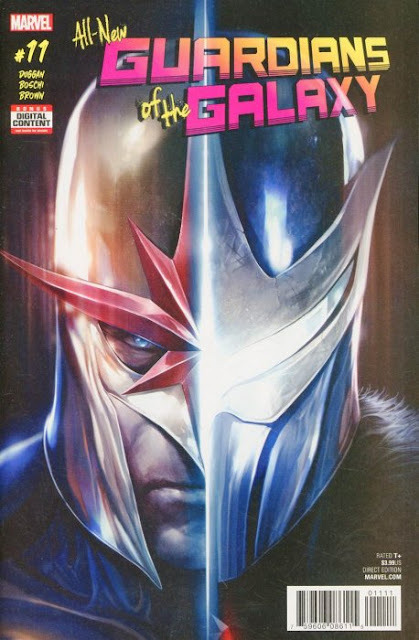 - A four issue mini-series about the Guardians involved in a double and triple-crossing scheme between two Cosmic Elders. - Four character-centric one shots that are prequels to the "Cosmic Heist" mini-series above. - A two-issue mini-series about the Guardians coming into conflict with a deadly warrior clan over a powerful artifact. 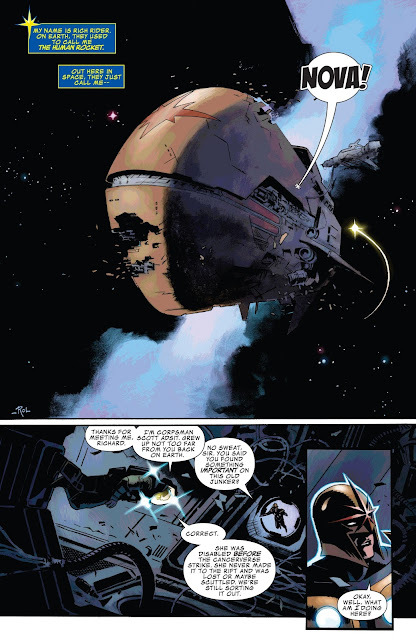 - A Nova Corps one shot that slightly ties in to the two issue mini above. - A Secret Empire Epilogue one-shot. Taken apart and re-assembled as above, this series is actually better than reading it from issue 1 - 12, but going it straight through is a fragmented and frustrating reading experience. Overall, there are some great moments, some really good issues, and some outstanding art throughout this series. . .and for that I can go ahead and suggest you give it a read. As far as I'm concerned, All-New Guardians of The Galaxy is a pretty directionless and fragmented series that REALLY left a bitter taste in my mouth at the end of it because I saw at the beginning of it (and at moments throughout) just how great it COULD have been. I'm just really disappointed. I think I've had enough Merry Marvel Mainstream Madness for now. All New Guardians of The Galaxy pretty much dumped on my enthusiasm for continuing this little experiment in reviewing more recent Marvel comics for now. There's plenty more Longbox Junk out there! I'm ready to get back into the good old dollar box. I'm not sure exactly where I'm going next just yet, but. . . Eight artists for twelve issues...is that some kind of record? I'm not sure if I will ever read this series, but if I do, thanks for the guidance. You provide a valuable service to the comic reading public. Your Longbox Junk blogs are always one of the highlights of my week!